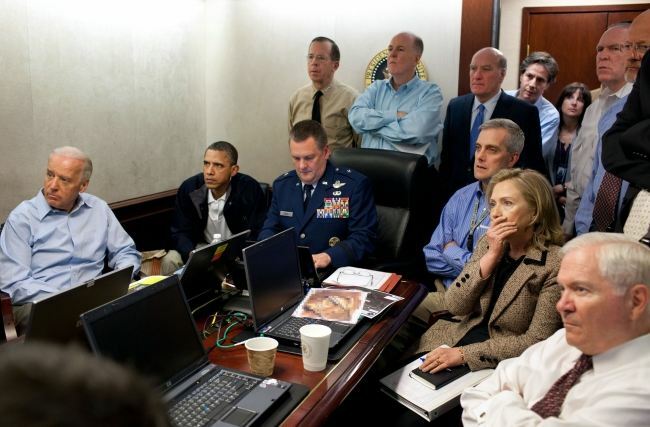 President Obama Hesitated to Give Order to Kill Osama Bin Laden-Fiction! - Truth or Fiction? A Washington “insider” account alleges that President Obama hesitated to give the kill order in the situation room during the May 1, 2011 mission to capture or kill the terrorist Osama Bin Laden. Various versions of this eRumor say that the President was overridden or overruled by Central Intelligence Agency head Leon Panetta, who really issued the kill order. We have not found any evidence to substantiate that Central Intelligence Agency (CIA) Director Leon Panetta overrode the President’s authority. All statements indicate that the order was given on the Thursday prior to the mission. In a May 3rd NBC news interview Panetta told reporter Brian Williams that the President signed the mission order on the previous Thursday, the 28th of April. BRIAN WILLIAMS: When did the President’s order in this mission become real and go up and become a possibility? LEON PANETTA: Well, as you know as we’ve been- debating this issue for a long time. And we had a number of sessions at the White House going over all of the intelligence and all of the approaches as to how we would conduct these operations. But it wasn’t until Thursday morning that the national security advisor called me and said that the President had made a decision to proceed with this operation. And then later that day I received orders signed by the President of the United States to proceed to conduct this operation under Title 50, which means it was a covert operation. And we would be responsible from the President for seeing that this mission was accomplished. On May 8, 2011 the President appeared on the CBS Sixty Minutes program and told reporter Steve Kroft that he was in the situation room monitoring the mission. Obama was aware of unfolding events around the compound and getting reports from special forces operations head Bill McRaven and Leon Panetta. KROFT: I want to go to the Situation Room. What was the mood? PRESIDENT OBAMA: Yeah, but doing a lot of listening as well, ’cause we were able to monitor the situation in real time. Getting reports back from Bill McRaven, the head of our special forces operations, as well as Leon Panetta. And you know, there were big chunks of time in which all we were doin’ was just waiting. And it was the longest 40 minutes of my life with the possible exception of when Sasha got meningitis when she was three months old, and I was waiting for the doctor to tell me that she was all right. It was a very tense situation. KROFT: What could you see? PRESIDENT OBAMA: As I said, we were monitoring the situation. And we knew as events unfolded what was happening in and around the compound, but we could not get information clearly about what was happening inside the compound. KROFT: Right. And that went on for a long time? Could you hear gunfire? PRESIDENT OBAMA: We had a sense of when gunfire and explosions took place. PRESIDENT OBAMA: Yeah. And we also knew when one of the helicopters went down in a way that wasn’t according to plan. And, as you might imagine that made us more tense. KROFT: So it got off to a bad start? PRESIDENT OBAMA: Well, it did not go exactly according to planned, but this is exactly where all the work that had been done anticipating what might go wrong made a huge difference. KROFT: There was a backup plan? PRESIDENT OBAMA: There was a backup plan. KROFT: You had to blow up some walls? PRESIDENT OBAMA: We had to blow up some walls. KROFT: When was the first indication you got that you had found the right place? That bin Laden was in there? PRESIDENT OBAMA: There was a point before folks had left, before we had gotten everybody back on the helicopter and were flying back to base, where they said Geronimo has been killed. And Geronimo was the code name for bin Laden. And now obviously at that point these guys were operating in the dark with all kinds of stuff going on so everybody was cautious. But at that point cautiously optimistic. KROFT: What was your reaction when you heard those words? PRESIDENT OBAMA: I was relieved and I wanted to make sure those guys got over the Pakistan border and landed safely. And I think deeply proud and deeply satisfied of my team. KROFT: When did you start to feel comfortable that bin Laden had been killed? PRESIDENT OBAMA: When they landed we had very strong confirmation at that point that it was him. Photographs had been taken. Facial analysis indicated that in fact it was him. We hadn’t yet done DNA testing, but at that point we were 95 percent sure. KROFT: Did you see the pictures? PRESIDENT OBAMA: It was him. Q: You stated that President Obama was “overruled” by military/intelligence officials regarding the decision to send in military specialists into the Osama Bin Laden compound. Was that accurate? A: I was told – in these exact terms, “we overruled him.” (Obama) I have since followed up and received further details on exactly what that meant, as well as the specifics of how Leon Panetta worked around the president’s “persistent hesitation to act.” There appears NOT to have been an outright overruling of any specific position by President Obama, simply because there was no specific position from the president to do so. President Obama was, in this case, as in all others, working as an absentee president. This update comes some 24 hours after our longtime Washington D.C. Insider first outlined shocking details of an Obama administration having been “overruled” by senior military and intelligence officials leading up to the successful attack against terrorist Osama Bin Laden. What follows is further clarification of Insider’s insights surrounding that event. I was correct in stating there had been a push to invade the compound for several weeks if not months, primarily led by Leon Panetta, Hillary Clinton, Robert Gates, David Petraeus, and Jim Clapper. The primary opposition to this plan originated from Valerie Jarrett, and it was her opposition that was enough to create uncertainty within President Obama. Obama would meet with various components of the pro-invasion faction, almost always with Jarrett present, and then often fail to indicate his position. This situation continued for some time, though the division between Jarrett/Obama and the rest intensified more recently, most notably from Hillary Clinton. She was livid over the president’s failure to act, and her office began a campaign of anonymous leaks to the media indicating such. As for Jarrett, her concern rested on two primary fronts. One, that the military action could fail and harm the president’s already weakened standing with both the American public and the world. Second, that the attack would be viewed as an act of aggression against Muslims, and further destabilize conditions in the Middle East. Q: What changed the president’s position and enabled the attack against Osama Bin Laden to proceed? A: Nothing changed with the president’s opinion – he continued to avoid having one. Every time military and intelligence officials appeared to make progress in forming a position, Jarrett would intervene and the stalling would begin again. Hillary started the ball really rolling as far as pressuring Obama began, but it was Panetta and Petraeus who ultimately pushed Obama to finally act – sort of. Panetta was receiving significant reports from both his direct CIA sources, as well as Petraeus-originating Intel. Petraeus was threatening to act on his own via a bombing attack. Panetta reported back to the president that a bombing of the compound would result in successful killing of Osama Bin Laden, and little risk to American lives. Initially, as he had done before, the president indicated a willingness to act. But once again, Jarrett intervened, convincing the president that innocent Pakistani lives could be lost in such a bombing attack, and Obama would be left attempting to explain Panetta’s failed policy. Again Obama hesitated – this time openly delaying further meetings to discuss the issue with Panetta. A brief meeting was held at this time with other officials, including Secretary Gates and members of the Joint Chiefs of Staff, but Gates, like Panetta, was unable to push the president to act. It was at this time that Gates indicated to certain Pentagon officials that he may resign earlier than originally indicated – he was that frustrated. Both Panetta and Clinton convinced him to stay on and see the operation through. What happened from there is what was described by me as a “masterful manipulation” by Leon Panetta. Panetta indicated to Obama that leaks regarding knowledge of Osama Bin Laden’s location were certain to get out sooner rather than later, and action must be taken by the administration or the public backlash to the president’s inaction would be “…significant to the point of political debilitation.” It was at that time that Obama stated an on-ground campaign would be far more acceptable to him than a bombing raid. This was intended as a stalling tactic, and it had originated from Jarrett. Such a campaign would take both time, and present a far greater risk of failure. The president had been instructed by Jarrett to inform Mr., Panetta that he would have sole discretion to act against the Osama Bin Laden compound. Jarrett believed this would further delay Panetta from acting, as the responsibility for failure would then fall almost entirely on him. What Valerie Jarrett, and the president, did not know is that Leon Panetta had already initiated a program that reported to him –and only him, involving a covert on the ground attack against the compound. Basically, the whole damn operation was already ready to go – including the specific team support Intel necessary to engage the enemy within hours of being given notice. Panetta then made plans to proceed with an on-ground assault. This information reached either Hillary Clinton or Robert Gates first (likely via military contacts directly associated with the impending mission) who then informed the other. Those two then met with Panetta, who informed each of them he had been given the authority by the president to proceed with a mission if the opportunity presented itself. Both Gates and Clinton warned Panetta of the implications of that authority – namely he was possibly being made into a scapegoat. Panetta admitted that possibility, but felt the opportunity to get Bin Laden outweighed that risk. During that meeting, Hillary Clinton was first to pledge her full support for Panetta, indicating she would defend him if necessary. Similar support was then followed by Gates. The following day, and with Panetta’s permission, Clinton met in private with Bill Daley and urged him to get the president’s full and open approval of the Panetta plan. Daley agreed such approval would be of great benefit to the action, and instructed Clinton to delay proceeding until he had secured that approval. Daley contacted Clinton within hours of their meeting indicating Jarrett refused to allow the president to give that approval. Daley then informed Clinton that he too would fully support Panetta in his actions, even if it meant disclosing the president’s indecision to the American public should that action fail to produce a successful conclusion. Clinton took that message back to Panetta and the CIA director initiated the 48 hour engagement order. At this point, the President of the United States was not informed of the engagement order – it did not originate from him, and for several hours after the order had been given and the special ops forces were preparing for action into Pakistan from their position in Afghanistan, Daley successfully kept Obama and Jarrett insulated from that order. This insulation ended at some point with an abort order that I believe originated from Valerie Jarrett’s office, and was then followed up by President Obama. This abort order was later explained as a delay due to weather conditions, but the actual conditions at that time would have been acceptable for the mission. A storm system had been in the area earlier, but was no longer an issue. Check the data yourself to confirm. Jarrett, having been caught off guard, was now scrambling to determine who had initiated the plan. She was furious, repeating the acronym “CoC” and saying it was not being followed. This is where Bill Daley intervened. The particulars of that intervention are not clear to me beyond knowing he did meet with Jarrett in his office and following that meeting, Valerie Jarrett was not seen in the West Wing for some time, and apparently no longer offered up any resistance to the Osama Bin Laden mission. What did follow from there was one or more brief meetings between Bill Daley, Hillary Clinton, a representative from Robert Gates’ office, a representative from Leon Panetta’s office, and a representative from Jim Clapper’s office. I have to assume that these meetings were in essence, detailing the move to proceed with the operation against the Osama Bin Laden compound. I have been told by more than one source that Leon Panetta was directing the operation with both his own CIA operatives, as well as direct contacts with military – both entities were reporting to Panetta only at this point, and not the President of the United States. There was not going to be another delay as had happened 24 hour earlier. The operation at this point, was in effect, unknown to President Barack Obama or Valerie Jarrett and it remained that way until AFTER it was already underway. President Obama was literally pulled from a golf outing and escorted back to the White House to be informed of the mission. Upon his arrival there was a briefing held which included Bill Daley, John Brennan, and a high ranking member of the military. 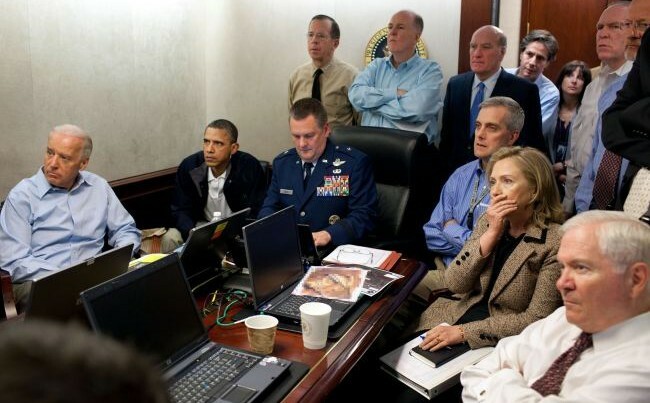 When Obama emerged from the briefing, he was described as looking “very confused and uncertain.” The president was then placed in the “situation room” where several of the players in this event had already been watching the operation unfold. Another interesting tidbit regarding this is that the Vice President was already “up to speed” on the operation. A source indicated they believe Hillary Clinton had personally made certain the Vice President was made aware of that day’s events before the president was. The now famous photo released shows the particulars of that of that room and its occupants. What that photo does not communicate directly is that the military personnel present in that room during the operation unfolding, deferred to either Hillary Clinton or Robert Gates. The president’s role was minimal, including their acknowledging of his presence in the room. At the conclusion of the mission, after it had been repeatedly confirmed a success, President Obama was once again briefed behind closed doors. The only ones who went in that room besides the president were Bill Daley. John Brennan, and a third individual whose identity remains unknown to me. When leaving this briefing, the president came out of it “…much more confident. Much more certain of himself.” He was also carrying papers in his hand that quite possibly was the address to the nation given later that evening on the Bin Laden mission. The president did not have those papers with him prior to that briefing. The president then returned to the war room, where by this time, Leon Panetta had personally arrived and was receiving congratulations from all who were present. In my initial communication to you of these events I described what unfolded as a temporary Coup initiated by high ranking intelligence and military officials. I stand by that term. These figures worked around the uncertainty of President Obama and the repeated resistance of Valerie Jarrett. If they had not been willing to do so, I am certain Osama Bin Laden would still be alive today. There will be no punishment to those who acted outside the authority of the president’s office. The president cannot afford to admit such a fact. What will be most interesting from here is to now see what becomes of Valerie Jarrett. One source indicated she is threatening resignation. I find that unlikely given my strong belief she needs the protection afforded her by the Oval Office and its immense powers to delay and eventually terminate investigations back in Chicago, but we shall see.